Brett Jewell goes in for the signature baby hook. Photo by Chantal Zdan. 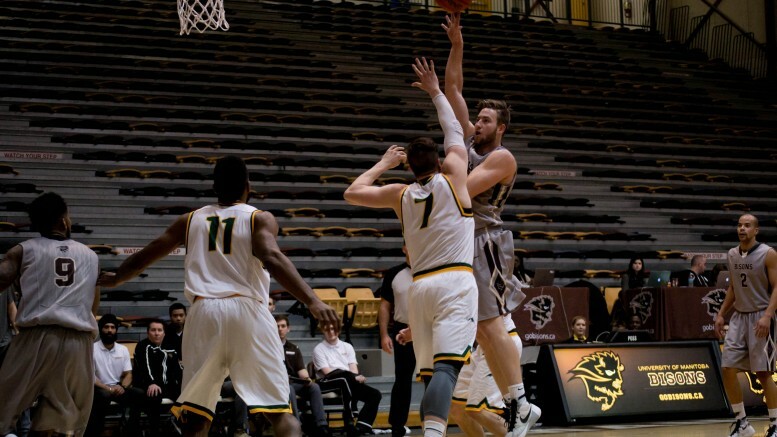 Saturday afternoons rematch between the University of Manitoba Bisons and Regina Cougars saw Manitoba’s starting five put on a show as each starter scored a minimum of 12 points. Justus Alleyn led the way with 13 overall in a game where the herd never took their foot off the gas pedal, dominating from start to finish in a 77-63 victory. The Bisons were able to shut down Regina’s three playmaking guards once more and also won the rebounding battle a night after being dominated on the glass. Keith Omoerah and Jonathan Alexander were spectacular, both recording a double double. The former had a game-high 18 boards along with 12 points a night after amassing 16 points and 14 rebounds, while the latter tallied 12 points and 10 boards. Cumulatively, the home side had 53 rebounds compared to 42 for the visitors. With Wyatt Anders sitting out the second game, Brett Jewell was looked upon to provide some offensive output and he did just that, scoring Manitoba’s first eight points on the night and finishing with 12 overall. As a team, Manitoba shot a strong 44.6 percent while the Cougars were an abysmal 28.4 percent. Their leading scorer was Jonathan Tull with 12 points, however he shot just 5-of-15 from the field. With the sweep Manitoba now sits in third place in the standings with just two weekend series left. Next up is a tilt with cross-town rivals Winnipeg in the Duckworth Challenge this coming weekend.